The SuperWHY app follows along the same lines as the PBS kids show, entertaining and educating young kids about words and reading. With 4 different games within the app, kids everything from tracing letters to picking the best word to finish a sentence from popular kids stories. Stickers are earnt throughout this kids app. 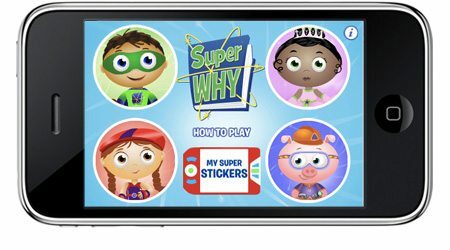 Overall, this is a great app -Â my 4 and 6 year old kids both enjoyed playing with this app, although sometimes guessing the wrong answer is just as fun in Super Why’s Story Saver. I would recommend this app to preschoolers all the way to 2nd graders who might need a little extra help with language arts. Kids help finish sentences from popular kids books by choosing the correct word. Children learn to spell words by listening to letter sounds and tracing the letters out. Play the game by selecting rhyming words. Once again, kids are encouraged to spell words by selecting the correct letter to continue on the letter hunt.